Can you identify the picture below? is it Noodles or Spaghetti. I know, it is difficult to find unless you have tasted it. Noodles and Spaghetti both look alike but they have a big difference form the way of cooking, serving and eating. The main ingredient of spaghetti is wheat flour, but noodles can contain different types of ingredients such as rice starch, rice flour, potato starch etc., A good quality of spaghetti is prepared of durum wheat. Noodles originated from China, where as spaghetti from Italy. The way of boiling of noodles to different from spaghetti. Noodles are boiled in hot water with out any addition of flavor, where as spaghetti is boiled in a salted and herb flavored (optional) hot water with few drops of olive oil. Noodles are served after stir frying them along with the ingredients where as spaghetti is served with sauce on topping. Generally, spaghetti is had with fork and Noodles with a chopstick. Now, enough of the story about their difference and jumping to the recipe. As mentioned above the cooking of noodles and spaghetti is very different But, I treat them the same and some times cook spaghetti like noodles and noodles like spaghetti. I do not mind changing the recipes because all that matters is about satisfying our taste buds. Here, I made a fried egg spaghetti with spaghetti sauce. Take a deep bottom medium size pan and and fill it with 3/4 volume of water. Bring water to boil and add 1/4tbsp salt, 2drops of olive oil and pinch of oregano/thyme (optional). Add spaghetti, and cook till it is done (Make sure you are not over cooking it. Take another thick bottom deep pan and add 1tbsp of olive oil and heat it. Add onion and green chili and cook till onion turns transparent. Add ginger garlic paste and when the raw flavor goes away, add spaghetti sauce and mix well. Keep stirring and cook for 2more min under medium heat. Drain water from spaghetti and add to the pan, mix well till all the ingredients are uniformly mixed. Check for salt and pepper and add if required. Now in the same pan move the noodles to one side and create an empty space, break open egg and add it on the other side of the noodles. 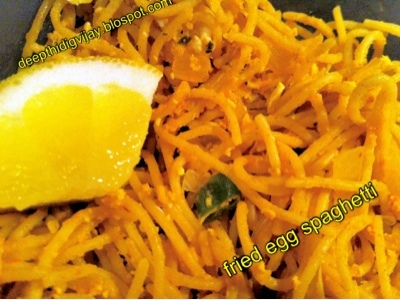 Cook till it obtains a omelet kind of texture, now scramble it and mix with the spaghetti. 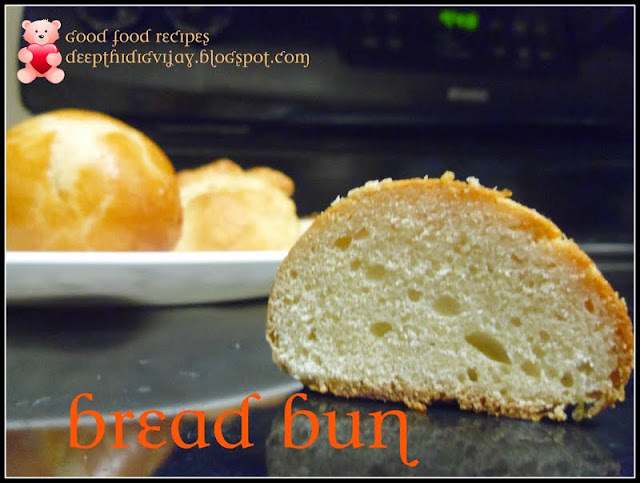 Serve hot, Hope you like my recipe and keep visiting for more wonderful recipes. You can also make Noodles in the similar style. I used tomato, mushroom raghu sauce, you can use any kind of sauce or only tomato puree instead of sauce. Website is very comprehensive and informative.Thanks for sharing. Nice post.Content was useful and informative.Thanks for sharing.